When you marry a beautiful woman you never think about what she will look like in 10, 20, 30 or even 40 years. You see her go through many hair styles and you miss her long hair. But when you go through a selection of 3000 4×6 prints and 30,000 digital photos you find she has been beautiful every single year. HERE IS WHO SHE IS, AND BELOW WHAT SHE LOOKS LIKE OVER THE YEARS. KAANAPALI – There are a lot of people who have moved here in the last 15 years who could be profiled for making contributions to our community. Minimal research and no interview were required for this one. Sara Foley at age three in Des Moines, Iowa was once placed in a stroller at the top of a hill. It rolled down and gathered speed since her sister had let it go – on purpose. Surviving that, nuns told her in high school she was “not college material.” At Iowa State University, she started and edited a campus magazine called Ethos. Sara’s first job – aside from working once in a candy shop – was as AP wire editor for the Champaign-Urbana Courier. Next, Sara went to work in Cicero, Illinois at the gigantic Western Electric Hawthorne Works as one of the telephone-maker’s first women in public relations. 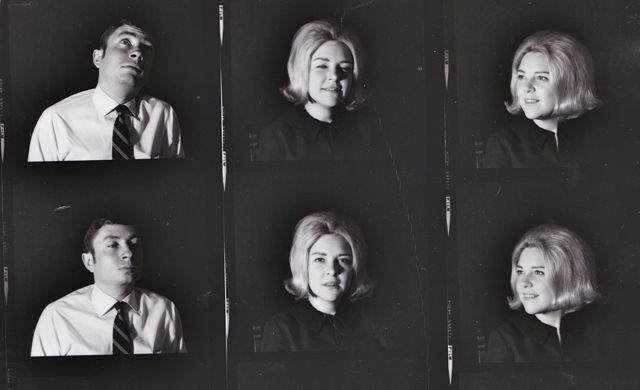 In 1968, she met a young business reporter in nearby Chicago at a party, and after a year of resistance, they began dating. She was promoted to New York to work for the company magazine, but the fellow got her back. She was promised a room full of flowers if she would return to Chicago and accept an engagement ring. Four months later, she got a room full of lilacs. 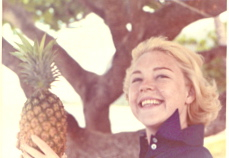 After the first day of summer in 1969 and a cake and champagne wedding reception at the Drake Hotel, she woke up for the first time in Hawaii on honeymoon at the Kona Inn on Hawaii Island. It is now a shopping center. Five years later, on vacation in Ireland riding in a carriage, she announced she thought she was pregnant. 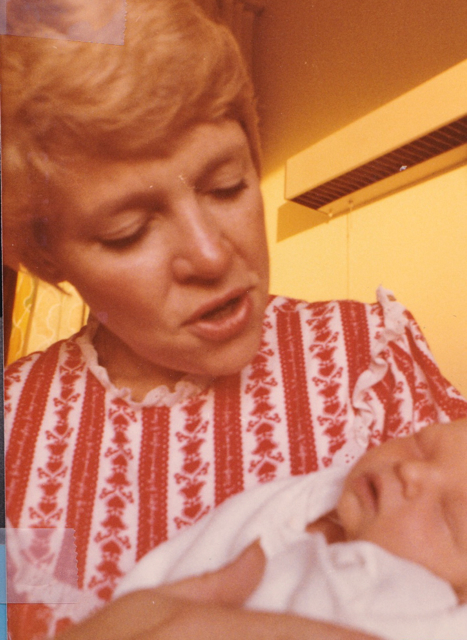 On Feb. 25, 1975, she had worked all day. Watching a Goldie Hawn movie that evening, her labor pains began, and she brought forth a girl who took her last name as her first. She was delighted more than she ever expected. Later, she gave birth to a son named after the main character in “Trinity” about the Irish revolution. She migrated to Kaanapali after almost annual visits over 20 years. Sara was not done. She formed a public relations firm with her husband and developed Maui County Fine and Fresh, a comprehensive program for the Mayor Alan Arakawa administration that won awards in Honolulu. Newly elected Mayor Tavares killed the program, even though the firm agreed to continue supporting it for free. Lahaina Galleries and “A Taste of Lahaina” were other clients. In 2011, Sara helped raised funds for the modernization of the Lahaina Public Library as a director of the Maui Friends of the Library and – for a time – member of the Rotary Club of Lahaina. She was supported by then-Rotary President Carmen Karady, who had the foresight to see that using a “Savor the Sunset” benefit to raise money for new library furniture would be a good project. Designer Rick Cowan, who picked the furniture, asked, “Why not redo the entire library?” The facility was badly in need of refurnishing. then re-shelve them upon completion. Sara wrote and secured grants, won the support of the Hawaii State Public Library System, coordinated development of a beautiful design, and served as a kind of general contractor, spending 1,200 hours alone in 2012 at home and 60 days at the site. She was not done. Last year, she worked on a plan to transform the library’s front lawn into a showplace that would incorporate more than a dozen Native Hawaiian plants, including a taro patch. The design, which has been incorporated in the Lahaina Restoration Foundation’s harbor project, is now before the budget committee of the Maui County Council and appears to have wide support. She has now moved on to serve as president of the condominium where she lives, launching a major recreation area modernization project. As a volunteer who is having a big impact, Sara is not alone among people who have come to Maui later in life to make major contributions. Pat and Richard Endsley (Voices, 10/11/13) and Diane Pure (Voices, 11/12/09) and Bob Pure come to mind. Sara after college couldn’t wait to leave Des Moines, then a smallish town. And now the big city girl is back in a small town. Lahaina continues to be all the better for it. Columnist’s Notebook: By way of disclosure, the inside information here comes from the fact that Sara – who has preferred to keep her maiden name professionally – is the columnist’s wife of almost 45 years. Next What were these people looking at on Memorial Day in Maui?